Second and last Lord’s Day, monthly at 7.00pm. Bailiesmills Reformed Presbyterian Church was established in 1807. When the Eastern Presbytery of the Reformed Presbyterian Church was formed in 1810, Bailiesmills became one of its constituent congregations. The old building was replaced by a new one, which was opened on 12th March 1994. The Rev George McEwen, who was installed in the congregation on 19th January 1990, retired on Sunday 14th September 2008 and the Rev Professor Robert McCollum, minister of Lisburn Reformed Presbyterian Church is in charge of the vacancy at Bailiesmills. Bailiesmills Reformed Presbyterian Church was established in 1807, and a building was erected on the present site. When the Eastern Presbytery of the Reformed Presbyterian Church was formed in 1810 Bailiesmills became one of its constituent congregations. In its early years Bailiesmills was under the supervision of Knockbracken Congregation, and enjoyed the ministry of the Rev William Stavely. In 1826 John Wright Graham was ordained and installed in Bailiesmills as its first minister. He served the congregation until his death in 1862. 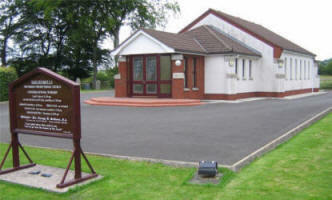 The old building was replaced by a new one, which was opened in 1994 and a church hall was erected in 1970. 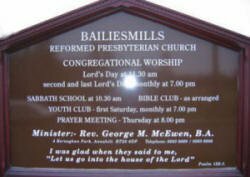 The Rev George McEwen, who was installed in the congregation on 19th January 1990, retired on 14th September 2008 and the Rev Professor Robert McCollum, minister of Lisburn Reformed Presbyterian Church is in charge of the vacancy at Bailiesmills.